Late sixteenth- and early seventeenth-century Dutch landscape paintings were primarily panoramic views painted with a multiplicity of design and color. In the 1620s, a group of artists in Haarlem—Esias van de Velde, Jan van Goyen, Pieter Molijn and Salomon van Ruysdael—began to turn to their native countryside for subject matter. They developed a more unified structure by employing a common tonality throughout their paintings. Ruysdael signed this jewel of a painting “Ruyesdael.” By 1630–31 he dropped the first “e” in his signature. Leo Collins (a.k.a. Cohen/Collings), Vienna. [D. A. Hoogendijk & Co., Amsterdam, ca. November, 1934- still in 1936]. A lanky man, his hands clasped behind his back, is trudging along a sunlit dune, while a horse-drawn cart rattles down the road in front of him. In the distance, the roof of a humble house rises above the engulfing sand, as dark, heavy clouds sweep the sky, and foliage bends in the gusty wind. Any moment it will rain. These are impressions of an afternoon walk along the dunes of West Haarlem, casually glimpsed in 1628 by the Dutch painter Salomon van Ruysdael. He is best known for his near monochromatic landscapes painted in subtle greys, greens, washed-out yellows, blues and browns. They convey the unique quality of light in Holland and the dampness of its landscape by the sea. Unity of form, color and atmosphere in this so-called “tonal phase” of Dutch art signified a growing interest in the particularities of Dutch geography and, by extension, its culture. 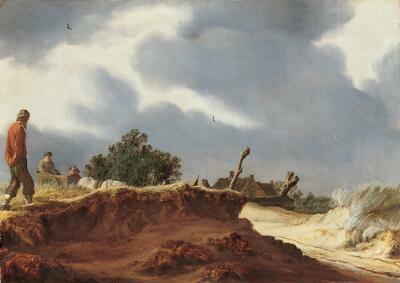 Earlier Dutch landscape paintings were often sweeping vistas minutely described in local color. Here, grandeur has been replaced by intimacy, universality by an emphasis on the familiar and accidental. The vantage point is low, as if we could reach out and touch the land. Van Ruysdael’s direct and unembellished interpretations of Haarlem dunes dramatically redefined 17th-century landscape painting, quickly establishing him as one of the most influential artists in Holland.